I'm continuing to have some success in adding ancestors to the tree, while at the same time I'm verifying, adding sources and citations, and adding flesh to bones. I've been hitting Ancestry.co.uk and FindmyPast.com pretty hard while I can. I also sometimes use the NORS facility on the Norfolk FHS website. Finally, I've collected my old paper records and certificates from my old days in pre-Internet genealogy. In some cases I have removed some proposed ancestors. During a moment of weakness, I allowed the My Heritage website to add some branches to my tree from those of other researchers. I wont do that again. Looking closely, and checking for sources myself, I disagree with the authenticity of them. I also found that I was barking up the wrong service record for my great grandfather. I'll learn by these mistakes. New branches or ancestors that I've recently uncovered include the Particular Baptist Tovel family of Suffolk, and the Daynes of Garvestone, Norfolk. 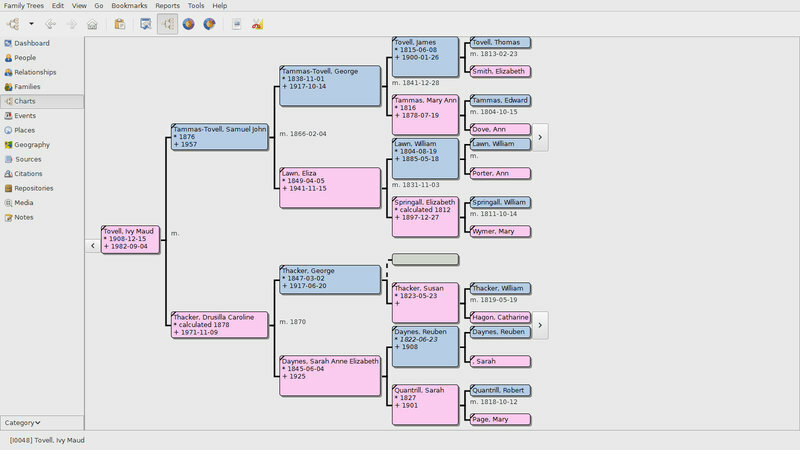 I found another handy feature on the open source Gramps genealogy software. A Number of Ancestors Report. It generated the below stats for me.